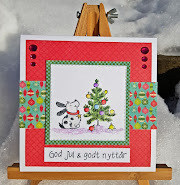 Hos Dorte: Christmas in July, DT card for Stamp and Create with Magnolia. Christmas in July, DT card for Stamp and Create with Magnolia. and a new challenge at Stamp and Create with Magnolia. I have used 'Winter Tilda' from Sweet Christmas Dreams 2011.
the image- but I'm not good at random! The flower is made with my retro punch and a rose on top of it. Papers today are from Maja Design. Blue and white are a favourite of mine. and added some bling onto the die cut. My usual backside, with my personal stamp. it's a sweet and beautiful card Dorte. Sweet and fabulous card, beautiful details. I so want to start making holiday cards-like this cutie! Super cute! Bare et dejligt kort med de kolde nuancer.....skønt at tænke på sne lige nu. Jeg er ikke god til denne varme. Du kan da fint bruge gaze/ostelærred, det er altid fint med mange forskellige materialer. A fabulous card Dorte. I love the layout and the gorgeous flower. Blue is one of my favourite colours and I like the colour coordination of you card and paper. 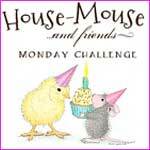 Thank you for joining in with our challenge at Penny Black and More this month. Good luck in our prize draw and we hope you will join us next month too. What a great work. I really like you colouring. Thanks for joining us at Creative Card Crew. SUper cute card! Love the sweet image and the awesome flower! Thanks for playing at My Craft Spot! Such a pretty card Dorte and Tilda looks stunning in the blue colours you have used. Nydelig kort, søtt motiv og flotte farger! Gorgeous card! I love the flower you created. Thanks for joining us at 7 Kids College Fund.